The democratisation of artificial intelligence has just taken one giant robotic step further to reality, following IBM's announcement of a $1 billion (£607 million, AU$1.1 billion) business unit tasked with making the brains of its Watson supercomputer accessible to all. 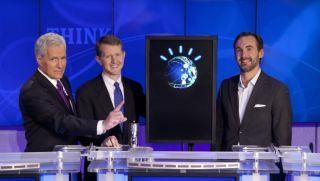 Watson, which rose to fame after beating humans at the television show 'Jeopardy' in 2011, uses language capabilities and analytics to process information similar to how people think, which allows it to analyse large amounts of data quickly. Named after former IBM president Thomas Watson, IBM is offering the supercomputer's talents to consumers and business users, who will be able to use it to develop apps for use in anything from healthcare and financial services to retail, travel and telecommunications. Watson's computing computing abilities will be delivered over the cloud via Softlayer, the cloud-computing infrastructure company IBM acquired for $2 billion (around £1.2 billion, or AUS$2.2 billion) in July 2013. Watson seems to have gone on a diet as of late, as IBM said that the supercomputer has now been shrunk from the size of a master bedroom to "three stacked pizza boxes". IBM announced back in November that it would make Watson available as a development platform in the cloud, allowing developers to build a new fleet of Watson-powered apps. A number of software applications are already underway. Fluid, a Watson-powered personal shopping app that learns from customers' responses and apparently develops relationships with shoppers, was one of the first to land in the consumer space. Others include an app by healthcare provider US-based healthcare company MD Buyline that helps hospitals procure devices, and another by social health management company Welltok tailors health plans for its members.